This is the eulogy I wrote/read for my father. I could barely read it, I was crying so hard. Everyone said they were fine until I got up there, and then I made them cry. That wasn't my intent. I had read it over so many times that I thought I would be okay. But I wasn't. Standing there, with the picture board, the flowers, and of course the marble box with my dad in it, was very different from sitting on the couch with my cats. I tried to come up with an analogy for Alzheimer’s, something simple yet expressive, to start this out with. I thought of something from my favorite book, about how the people around us are the chisels which carve us into who we are, and that’s not bad—we are indeed shaped by those around us, and my dad influenced me, obviously, very much. But I’m not here to talk about me. I want to talk about my father. He had a hard childhood. His aunt, Aunt Bert, took him into her care and did her best to make that childhood bearable. He grew into a kind man, a quiet man, a good man. He wasn’t flashy or loud; he didn’t hold your attention. He was a background kind of guy. I never realized how much he did, invisibly in the background until I moved out. I found out the garbage does not magically take itself out every night, the cat box doesn’t get scooped and there is no Soda Fairy to make sure there are always a couple of cold bottles of soda in the fridge. So when you come to my house, and there’s no cold soda, the cat box is dirty and the garbage can full, that’s because my dad doesn’t live there! Seriously, I have learned to scoop a cat box and put soda in the fridge, although I still have trouble with the trash. But it really gave me an appreciation of my dad that maybe I didn’t have growing up. I can remember that, when I was really little, in the living room we had 3 lights on a pole, and he used to make shadow animals for me and tell me stories about them, especially Jerry Giraffe. He would come home after a 12 hour day at work and still have time to tell me those silly stories, and when he wasn’t there I’d try to tell them to myself, and now I’m a grown-up, and I still tell stories. When I cried because I wanted my daddy to stay home with me, he’d say “I’m going to makes some dimes for you,” and ruffle my hair before he went off to work. He was a successful car salesman, winning salesman of the month and year awards many times. I think it was because he wasn’t a high pressure salesman. He took the time to explain everything carefully, lay it all out, and let people make their own decision. And he remembered. If you bought a car from him, and a few years later he saw you in Stop and Shop, he’d know what car he sold you, what color it was, probably what you traded in, he’d know your name, and probably your spouse’s name. In fact, one time he was at a car show, and a guy was showing a car my dad had sold him brand-new, and he had the original sales paperwork with my dad’s signature on it…and my dad remembered him, even though it had been more than 20 years. People like my dad—quiet people who get the job done without any fuss–are really the cogs and glue of society. You rely on them without realizing it. They are strong, but they never complain about their burden. Even after he got Alzheimer’s, he didn’t complain. He apologized. I’m sorry, he’d say. I can’t remember things anymore. I can’t talk so good anymore. One day, I asked him for his opinion on something, and he said, deep down inside, I don’t know anything anymore. He didn’t know who I was, but he knew that if it was dark out, he should walk me to my car with a flashlight “so nothing bad would happen”, and then he would shake my hand and ask “when are you coming again?” His instincts were always to be helpful, to hold doors and carry packages. He was still my dad, but blunted, truncated. That brings me back to my analogy. I imagined a really beautiful, perfect statue, left out in the wind and rain for centuries, to be worn away, until it’s only retained the shape of a person, not any of the individuality. That’s what Alzheimer’s did to my father. It wore him away, all the sharp edges and crisp points that made him Bob Rizza, who loved his family and his pets and his raspberry bushes, and turned him into a fearful person with a vague and confused stare. No, dad, it wasn’t enough. Only remember me; you understand It will be late to counsel then or pray. which I got from this site. Of all the comrades e'er I had, they're sorry for my going away. And all the sweethearts e'er I had, they wish me one more day to stay. I'll gently rise and softly call, goodnight and joy be with you all. It is really a drinking song, but I read it a few years ago and thought it sounded more like a funeral song to me. And oh, the people who came! Lots of my friends, of course (and you really find out who your friends are when someone close to you dies and you see who rallies to your side and who vanishes), old co-workers of my dad, my mom and me; neighbors; family, friends, and people you'd never expect: the plumber. The accountant. Two ladies my parents met while walking. My best friend's parents and her mother-in-law. There was even one person my mom and I didn't know at all. I couldn't understand who this woman was kneeling in front of the picture display and crying. My mom didn't know her either. I felt awkward saying "who are you?" but I asked anyway. She owns a store next to my father's friend's store, and my dad used to help her do postcard mailings in exchange for cookies. She said she just did a mailing and was thinking how she missed my father's help, and then she heard that he died. My mom and I both knew she sent home cookies with him, but we'd never met her, and she was genuinely sad to hear about his death. And the refrain we heard over and over was "He was such a nice man. He helped me so much. He didn't deserve this." My mom had thought that there wouldn't even be ten people there, and the room was filled when I was reading (sobbing through) my eulogy. And some people had came and left, just saying hello and not staying. I just tried to write down from memory everyone that was there and I came up with 45 people I could name, plus some neighbors whose names I don't remember. My mom counted 50 names in the register, but some I listed by memory didn't sign. Call it 60. Over half a hundred people came to say goodbye to my father. Plus all you online, who never met him OR me. Call it a hundred, then, since I get 50 hits a day on average here. My grandma, of course, had to make it about her. She didn't want to go and "be a burden." She'd be "in the way." My mother basically forced her to go, and she sat there at the end of the row with her "puss" face on because she didn't want to be there. My best friend left early to go back to my mom's house, start the coffee, deal with the dog and let everyone in. She brought my grandma home. Later on she said to me, "I never want to have your grandmother mad at me!" Apparently all my grandmother did was complain all the way home (luckily only a mile). And then when the dog barked at Beth, my grandmother made a huge fuss over that, saying the dog was going to bite her. Beth has dogs, knows dogs, and Ace has met her before and not bitten her--in fact, he likes her. Beth was happy to practice her sign language on my father's cousin and her husband (she is deaf from an illness in her infancy; he is deaf from a car accident when he was 12) and to be a hostess--she excels at things like that. 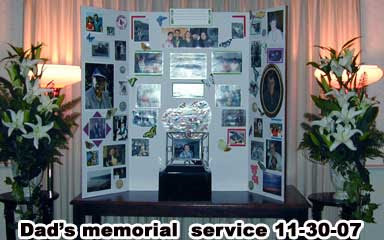 She is also the one who did most of the work on the memorial boards. I'll devote an entry to them later. The minister had a little too much God and Jesus in his service, but I just ignored most of that--take what you can use, leave the rest. He read two really nice poems, one about remembrance and The Dash. (When I find out the info on the other poem I will link to that one too.) My mom enjoyed his service, so that's good enough for me. Of course this would be difficult and incredibly sad... How nice that so many people were there with you to remember him! I know that I-along with the rest of your virtual support-was certainly thinking about you and your dad all weekend. The imagery is very powerful and accurate (and graphic)--I can really identify with what you wrote. Kudos to you for taking the high road and letting the religious stuff go. I'm afraid that mom's service might end up featuring a pentagram if I have anything to do with it. Which would be horrible for a former nun... so of course I will try to restrain myself. The flowers were certainly beautiful, I'm sorry that it was not what you ordered. 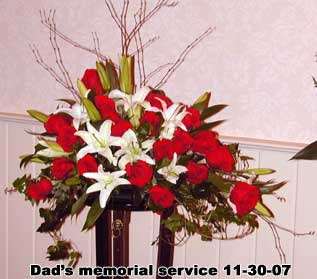 I do wonder about florists some times--I mean you order something from a catalog but it never looks like what you order! I still remember being very clear about not wanting a single carnation at my wedding... and what did my entire bouquet turn out to be?... Carnations! What the heck can you do about it on the day of, eh? To paraphrase Lucy Van Pelt: "It's run by a big eastern syndicate, you know"
The quiet people ARE the ones who get things done in the world. I'm afraid that often we don't appreciate them until it is too late. You are a good daughter and it is evident that your dad was a great dad. I see you did the same thing we did - put up pictures of your dad on a board. I know this is something many people are doing these days and I really like it, because it helps you remember people the way they were. Your eulogy was beautiful - a real tribute. We were very lucky that our old minister was able to come (out of retirement) and talk about my dad; he had known him really well for 30 years. I'm not a big one for getting up in front of everybody so I didn't speak about my dad, but the minister really brought him to life for everyone, describing him so well - just as you did about your dad. I feel as if I knew your father just from reading your eulogy. I love the Christina Rosetti poem.